Seoul International Women’s Association will hold the 2016 SIWA & Diplomatic Community Bazaar next month, providing an opportunity to find high-end craftwork or do some early Christmas shopping while raising money for charity. The event, which the association has run since the 1960s, invites charities, embassies and other sellers and organizations to sell goods there, with money raised going to charity. “It’s going to be a very special mix of a few new embassies who have not been with us before and returning ones as well. And we will be having entertainment throughout the day that is always worth looking forward to, so it should be a great event for Koreans and expats alike,” said SIWA Vice President Robin Carney. The bazaar will offer a wide range of food, and there are high-end craftworks and imported wines available at a discount off regular retail prices. Christmas items such as decorations and cards are also on sale each year. “The SIWA and Diplomatic Community Bazaar is (not only) the best place to discover wonderful international products in a good atmosphere, but also a great opportunity to help a lot of charities,” said Justesse Gomis, SIWA’s bazaar chair. The bazaar will also feature performances throughout the day, including jazz by the Iced Americano Trio and singing by the Camarata Music Company, a local organization that connects locals with expats to give them the chance to perform classical and other music. On the sidelines, visitors can buy tickets for a raffle with prizes from stores, restaurants and spas. The event attracted about 5,000 visitors last year, including tourists, and the association expects a similar number this time around. “The annual bazaar brings SIWA, the diplomatic community and other expat organizations in collaboration to raise money to help the many disenfranchised members in our host country,” said SIWA President Anne Choe. The proceeds generated by SIWA from the event will go toward local charities, enabling them to serve the Korean community better. Hosted since the 1960s, the SIWA Bazaar has raised over 2 billion won ($1.76 million) over the years. The money goes to SIWA’s Welfare Fund, which reviews requests from charities and distributes the money, with the most common causes being disadvantaged children, homelessness or disabled people and senior citizens. As part of its welfare efforts SIWA held a coffee morning to raise awareness of breast cancer on Oct. 19, with a talk on screening and prevention by Korean Cancer Society President Dr. Noh Dong-young, a prominent breast cancer surgeon in Korea. The association made a donation of 10 million won to the Korea Cancer Society at the event. Another beneficiary from last year’s funding was Mubeopjeongsa Yongin Home of Youth, also known as Big Mama’s House, which houses disabled children and their siblings. The home needed a new floor to house some of its children and meet regulations. “Big Mama’s is one of the charities that we have consistently supported over the years,” Carney explained. 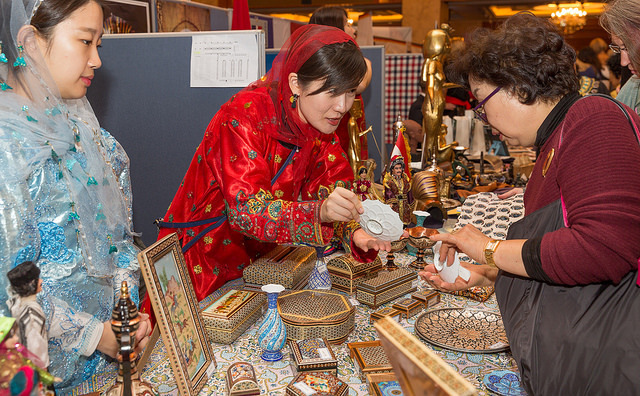 The SIWA & Diplomatic Community Bazaar runs on Nov. 14 from 10 a.m. to 3 p.m. at Lotte Hotel Seoul. Admission is free. For more information, visit http://siwapage.com/major-events/bazaar.